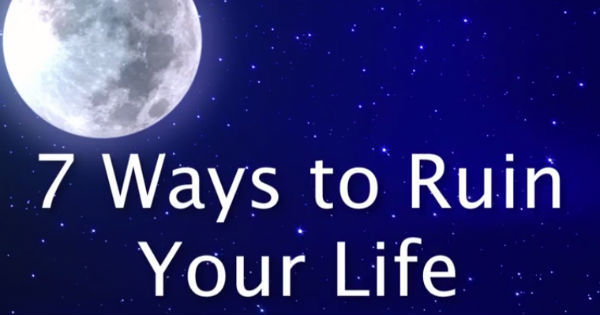 This short video lists seven ways that you can use to ruin your life. Even though most of you would say that it is silly to ruin our lives on purpose - pretty much all of us are guilty of doing at least a couple of the seven points listed. I hope you can prove me wrong! How to Ruin Your Life? Here are the 7 Ways to do so Easily. Enjoy the short video that lists all of the seven ways to ruin your life with little effort, and find a more detailed post below. I hope you cannot find yourself doing any of these seven points, but in truth, it's highly unlikely. 1. By worrying about what others think of you. There is an epidemic today of people who worry about what others think of them, and because of that worry they do not allow themselves to life the lives they want to lead - so release those needles worries. Considering the opinions of those that are closest to you does make sense, up to a point. But worrying about what a stranger or an acquaintance might think of you will only help you to create more worry, instead of creating the life you want. It is understandable why you would worry about opinions of others. We are tribal creatures after all, and humans did live in small tribes way back in history. During those times, if one member of the tribe didn't like you - it was a big deal. Not so today when there are over seven billion people on Earth! 2. By staying in a job you hate. When people stay in a job they hate, all it does is remind them every day how much they hate that job and how powerless they are to change their situation and find the job of their dreams. If you are in a similar situation, it is understandable that you have to pay your bills on time and feed your family. I only urge you to consider finding a job that you would actually like, even if it pays less. 3. When you complain about everything. When you complain about something, all you are really doing is communicating that you are powerless, while the truth is that you have the power to create change - complaining won't help you change your situation, nor make you feel better about it. Life is not fair and none of us are dealt the same hand. This is something we all have to accept. Complaining about it won't change the fact. 4. When you pick the wrong partner. You are the sum of five people you hang out with the most. That is why it is crucial to carefully choose the friends you hang out with, and why it is especially crucial to wisely chose the person you spend most of your time with - your partner. Picking the wrong parent might not mean that you will lead an unhappy and an unfulfilled life, but it will limit your growth potential and hinder you from achieving your life purpose. 5. When you believe more money will make you happy. When you are lacking money, it is easy to assume having more of it will make you happy. This is not the case! Quite the opposite is true. When you are happy and feel abundant, money will find it's way into your life - you will simply attract it because you are who you are. 6. When you compare yourself to others. None of us have the same purpose in life. That is why we cannot compare ourselves to anyone else. 7. When you don't go after your dreams. The only way to be happy is to go after our dreams. Even if you don't reach what you were going for - you will still be happy - simply because life is not about the destination, but about the journey you take. You are a unique individual and deserve happiness, love and money in your life. Share this video if a friend needs to hear this message.